The Volunteer Income Tax Assistance, or VITA, program is a service provided by the Internal Revenue Service for low- to medium-income taxpayers. The IRS actually just coordinates the service, while volunteers fill all the staff positions at the community tax preparation sites. These positions are completely unpaid, and many of them require professional certification and management experience. It’s a service that members of the community provide for anyone who needs help understanding their tax returns and perhaps translating the documents to other languages. 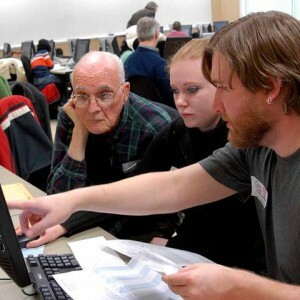 A similar program, called Tax Counseling for the Elderly, or TCE, is provided at the tax preparation sites, and like the general tax assistance program, TCE provides free help and e-filing for people in the community. Of course, TCE is intended for senior citizens, but both services are offered simultaneously at every IRS tax location. It takes a lot of volunteers to help all the people who come for free tax assistance every year, and the choices of positions include greeter, translator, site coordinator, tax preparer, reviewer, technical support specialist and tax coach. These volunteers share their time and talents, but the benefits of helping the community are certainly worth the effort. In order to qualify for free tax assistance, a person has to make no more than $53,000 per year, have a documented disability or speak limited English. Every year, about 3.6 million taxpayers seek the assistance of the more than 96,000 volunteers working at tax preparation sites across the country. Volunteering one’s time has immediate personal advantages, however, and this service can be listed on a resume and even lead to professional opportunities. Who Is Helped by Free Tax Assistance? Most people who take advantage of the VITA program are immigrants who need help translating tax documents to their native languages, and this language barrier generally makes it harder to earn high incomes. The next most common need for tax assistance is for disabled taxpayers who have special accessibility requirements. While there are no labor costs to the organizations offering volunteer tax assistance, there are facility costs, and the IRS offers matching grants for businesses and non-profit groups that provide this service. The IRS, of course, is a government agency and not a business, so the money it saves by not paying volunteers is money saved by taxpayers. Therefore, it’s in everyone’s interest to make this free service available to the economically disadvantaged, disabled, elderly and newly immigrated. These programs are offered in all 50 states as well as the District of Columbia, and grant-awarding criteria ensures that they appear where they’re most needed, such as poor urban and rural communities. Organizations that work with the IRS to offer tax preparation assistance are usually non-profit groups that work to increase the accuracy of tax returns and the rate of electronic filing, which is cheaper and more efficient than paper filing. Not only does tax assistance help the most under-served populations in the country by providing free consultation and e-filing, it saves money for taxpayers in general by increasing tax return accuracy and streamlining administrative duties. Tax time is a stressful time of year for most people, and no one is hit harder by this occasion than immigrants, the elderly and the disabled. The VITA program, along with the TCE program, make tax preparation easy and accurate for the most disadvantaged taxpayers.